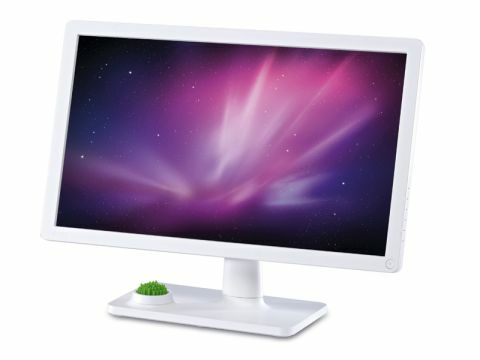 The V2400 Eco Series is a new LED-backlit display from BenQ and features a white finish that would be an excellent match for a Mac mini if it were a little more shiny. With its off-centre stand and built-in stationery holder, it's great to see a monitor designed with a little individualism. The V2400 Eco can be wall-mounted using VESA standard brackets and tilted back 5º and forward up to 20º, but not vertically adjusted. Connectivity options are limited to VGA or HDMI, so if you want to use it with a modern Mac, you'll need an adaptor or a HDMI-to-DVI cable. In operation it performs well, placing it among (but not atop) the better displays in its price bracket. It displays smooth, clear colour ramps, and is quite capable of distinguishing between 95% and 100% black; and at the other end of the scale, 5% and 0% black. But its pure whites betray a bluish tinge, especially in the energy saving Eco Mode, which we found almost unusable. Our dark-screen test showed very little bleedthrough from the LED backlight, but perfect consistency eluded it in our single-colour tests. The centre of the viewing area is noticeably brighter than the edges. Its viewing angles aren't great either, with the colours losing definition soon after you leave the head-on position. The BenQ V2400 Eco Series wouldn't suit a professional designer or animator, but at this price, you wouldn't expect it to. Rather, it's a competent budget display for a home user, especially one who's tired of black monitors.